Nice quality trousers in a lightweight cotton with a bit of stretch to it. 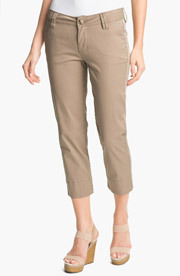 Fab for the busy gal on the go, and for a very casual work environment. Pair them with anything from a denim shirt, striped jumper, patterned high-low blouse to a sassy sweatshirt, bomber, leather jacket, vest or a dressy blazer. Be sure to roll the bottoms to shorten the length! The pants come in eight classic and fun colours. Also available in petite sizing. They run a tad small, so you may need to size up. I own these and they’re divine. It took me forever to find the perfect pair of harem pants and now I have them. They drape beautifully and the side entry pockets are fabulous. Soft, slouchy, well made and extremely comfortable. 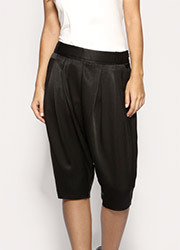 A great item to dress up or down when you’re after something other than a pencil skirt or slacks.